Here’s a link to Part One! And click here for Part Two! So so pumped to have completed this challenge with a finished game! It is polished? Heck no! 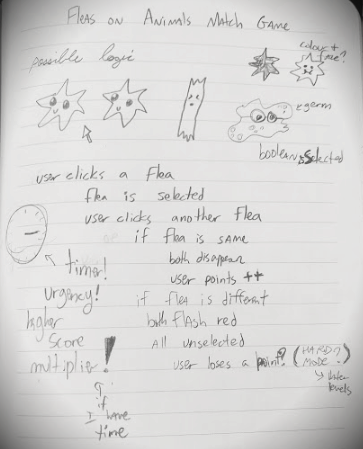 It’s possibly not even fun to play – but it sure was fun to make, and selfishly this Ludum Dare was all for me bb. 2-dimensional array – Implementing the 2-d array was a great way of randomly generating the flea pairs by ensuring there would never be a lone flea without a mate. The array keeps track of the flea index, flea sprite and flea id of the first click and the second click. A comparison is made to compare the two and decide whether a match is found (yay!) or not (boo!). 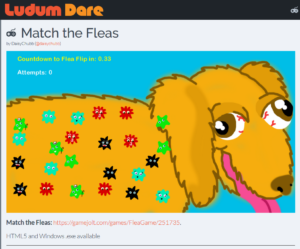 Advanced matching – so I should’ve gone the easy route and just made a colour or shape matching game – but it just didn’t feel right in the flea-world. I wanted to add a little pizazz, so I referenced a more difficult matching game tutorial. The idea is to use one sprite with multiple frames, so the player is matching a similar (but different!) flea rather than the exact same one. No Drag and Drop here! – I am very excited to have used a ‘controller’ in each room to populate the visual elements. A nested for-loop is used to populate each flea-type, using counter variables to ensure there is always a mate for each flea! No flea left behind. 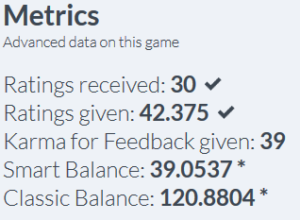 I definitely should have paused the tutorial to test and run the game early and often! D’oh! GML is pretty user friendly! The documentation is clear and concise and I enjoyed searching through the docs before turning to Google. The more programming languages I run into, the more I realize how similar and universal some core principles are. Variations in syntax are a learning curve for sure, but I’m definitely gaining coding confidence! What if I kept working on it? Well, I am probably not going to take this game any further, but my original brainstorm gives me an idea of what the grand vision of the game could be. I imagined it in old flash game meets slick mobile app style. 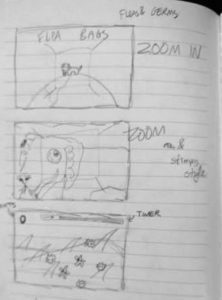 The game begins with a little animation zooming in on the dog’s weird face (a-la-Ren&Stimpy) and then zooming in even closer to see the fleas hanging out in their natural habitat. Ideally the fleas are animated for the whole game, wriggling around and dancing to the background music. 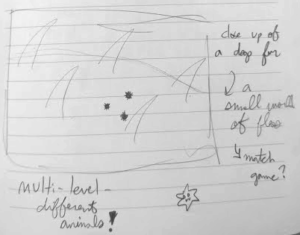 Each level would increase in speed and difficulty and the animal would change (dog -> cat -> giraffe -> unicorn -> etc). A timer function and score multiplier would increase urgency and reward you for matching fleas fast. Of course there would also be a high score table which may add replay value? Anyways! That’s my game in a utopic timeline. Well folks, thanks for reading my 3-part post mortem! 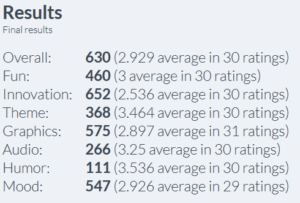 I really enjoyed by first Ludum Dare experience and look forward to playing and rating your Ludum Dare games! Comment with a link to a game you’ve made and I will give it a whirl. Of course, click here to play Match the Fleas! Yay! In the top 8th percentile for humour 😀 I got tons of amazing feedback from this very friendly community. I can’t wait to apply it to the next Jam at the end of July. Click here to read Part One! Ludum Dare is split into two parts: The Jam and the Compo. The Jam lasts 72 hours and is fairly open and flexible. The Compo is a bit more challenging, only 48 hours and you must share your source code at the end of the competition. I had an optometrist appointment Saturday morning so although I got up at 8am to eat a good breakfast, I dashed out to learn how to jab contacts into my eyeballs and didn’t get home until noon. I had a commitment after work on Monday which meant I would have to submit on Sunday (48 hours), although I would submit for the Jam because my source code would mostly come from the aid of tutorials! I’m not really into cowboys, so I did a bit of planning before I started coding. Admittedly my game development knowledge is lacking, so I attacked it like any other coding problem and detailed what I thought the game loop might look like. Dungeons & Dragons is great, Drag is great, Death Drops are great – Drag n Drop… mmm not so great. This is something I avoid when making mobile apps in Android Studio. The idea of drag-and-drop is to add ease and simplicity to a process, however I find the underlying code can be messy and often it’s more frustrating and encumbering than quick and easy. I felt confident enough in my junior programming skills to avoid the DnD feature of GameMaker as much as possible. 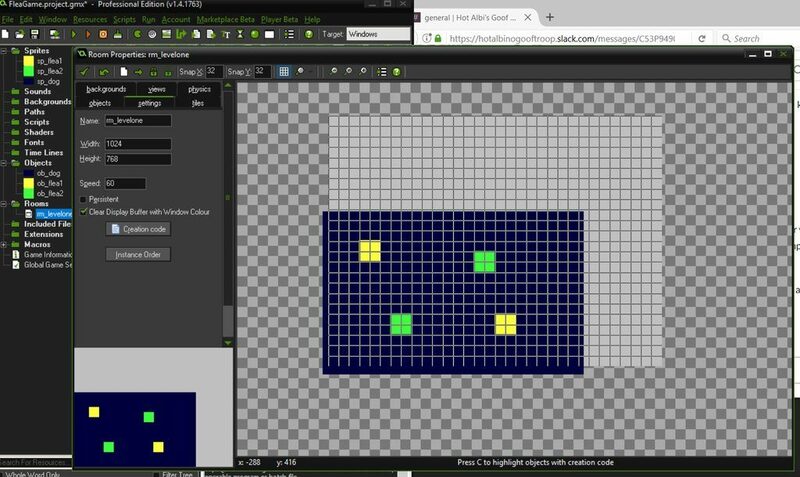 Learning GML (Game Maker Language) would be a great way to cross “Learning something new” off my goal list. Well I was stuck for quite a while! This was quite the dilemma, I had been on a roll but now? Stuck! Of course it was bound to happen, but I couldn’t help but feel a bit hopeless with time running out. I considered the pivot! 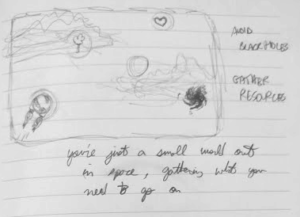 Should I scrap everything before I make any art and use Twine to create a story based game? Should I start from scratch with the tutorial again? I needed a break. But I get up again! My while loop was the culprit. Control flow wasn’t flowin’. Also, my brain does not compute x & y coordinates very well. In fact my wild guesses as to where to put things and how many to put where were close but wow I really should have taken a moment to draw a grid and figure it out. Lesson learned! Speaking of lessons learned – I learned a LOT during this process! 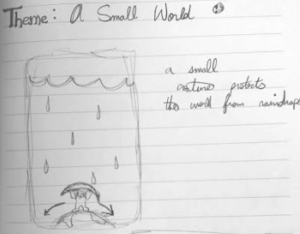 For example, I got the chance to implement a 2-dimensional array, which previously I had only experienced in a final exam: coding with pencil and paper. Really fun to see it work its magic. I’ll dive into this more in the next post. I took the rest of the night off for a hearty meal and video games, of course. Slept in the next morning, and got back to work around 10 on Sunday. 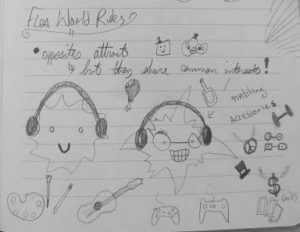 Throughout the afternoon I alternated from designing the start and winning screen, to recording audio sound effects with Audacity. Tune in to the third post of this 3-Part retrospective, where I share the finished game and reflect on what went wrong, what went right and what the future holds!